Cognitive Bias training for CSI, forensic examiners, QA and managers across forensic science domains. 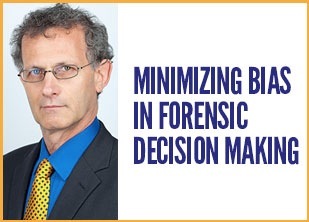 The Minimizing Bias in Forensic Decision Making training program is is aimed at CSI, forensic examiners, QA and managers across forensic science domains. “This program is directly relevant to the document recently adopted by the National Commission on Forensic Science (NCFS). The practical implementation of this document (“Ensuring That Forensic Analysis Is Based Upon Task-Relevant Information”) is presented and discussed, as are the recommendations of the National Academy of Sciences report on forensic science.,” explains Dr. Dror.